Clip-On 5 LED Cap Light. Light up any dark place hands free! Clips on all cap brims. Easy on and off. HT Night Star Strike Lite easily attaches to the flag apparatus of most tip-ups on the market. The "dual strike light" makes this strike like no other light. Simply choose hi-viz "green" or ultra-bright "orange" as your indicator. Your fishing friend may choose the other color. Now you can fish side by side and instantly know who has the bite! Comes with lite and Lithium Battery. HT Super-Lightweight(1/4 oz. 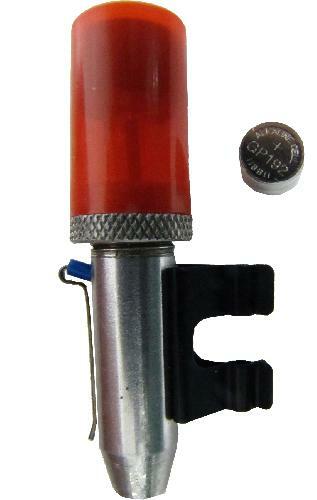 ), Easy to mount "clip-on" feature, High intensity red light can be seen 50 to 100 ft. away. Comes with Lithium Battery. HT All Season Micro-Lite is designed for use on any Tip-Up. Comes equipped with micro sensitive, switch-release, bracket and "quick clip" for easy mounting. (Comes with 2 standard 1.5V batteries(hearing aid 312 or 392). Shop Extacklestore for HT Ice Fishing Rod & Reel Combos, Ice Fishing Tackle, Ice Shelters, Ice Fishing Tip-Ups, Ice Fishing Accessories, Polar Fire Clothing, Ice Augers. Lights & Batteries for all your ice fishing equipment.